I received the following message from Home Base Holidays member, Angela Dold, and am including it here as a reminder for others who set off on their travels some time before a home exchange takes place, to ensure there is a way for exchange partners to contact them en route if needed. 'I’ve recently read your newsletter re the conditions and etiquette when undertaking a home-exchange (Home Swappers April/May, article: Home Exchange Email Code of Conduct). Illness caused my UK home-swap to cancel their arrangement with me in New Zealand, but because I’d left New Zealand four weeks before the exchange date I could not be contacted. Prior to this my UK swapper and I had emailed regularly. My friend and I found a message waiting for us when we arrived in London just prior to moving into the house, and as you can guess, we were quite devastated at the news that we could not do this. The UK is an expensive place to visit; we weren’t leaving for NZ until 6th December and it was then early October, so a long time to stay in unplanned accommodation. However, the couple were absolutely wonderful. They let us stay with them in Ely for a few days, taking us on short trips around Cambridgeshire; they then went on a short cruise while we used their house for ten days. They allowed us to leave our big suitcases with them, and when we picked up the cases to go home, they offered to drive us to Heathrow Airport. I know the couple were as upset as we were over the cancellation, but they did everything they could to lessen our disappointment and it was doubly appreciated especially as the lady was to undergo cancer treatment. Because of the hotel costs, extra food costs, etc. the holiday was much more expensive than we had bargained for, but we still had a marvellous time. I was so sorry to hear of Angela's unexpected (and expensive) problems on her trip to the UK last year. It is wonderful that, in spite of what must have been a very worrying time for them, her exchange partners did all they could to help out and that Angela and her friend had a good time on their holiday despite the illness that prevented the exchange taking place as planned. Although Angela (and her exchange partners) were very unlucky to have their exchange plans fall through, their experience illustrates a situation I have to admit to not even thinking much about before, that is, when members' travel plans involve being out of touch for some time before an exchange is due to take place. In such situations, either leave a contact telephone number (a friend or relative, ideally the same person who agrees to act as your 'agent' to welcome exchange guests, hand over keys, etc) of someone who will be able to get messages to you if needed during your travels. Or, usually easy now, plan to check email at least a couple of times a week while travelling (public internet access is now available in most places, in cafes, public libraries and hotels). At least in this way, there would be a little time to make alternative plans should problems with exchange plans arise after you set off. Some members do make provisional plans for the unlikely event of one party not being able to go ahead with an exchange (such as providing a second home or agreeing to pay accommodation rental costs for their exchange partners - see articles in recent issues of Home Swappers Newsletter, Home Exchange: Planning for the Unexpected and One-Way Exchange: When a Member Can't Travel) but it is likely the case that the majority of members won't cover all such possible, but very rare, 'what if' situations in their exchange arrangements. In a case such as Angela's, when already travelling, any travel insurance policy is unlikely to have covered the cost of renting accommodation when the exchange fell through due to her exchange partner's illness. However, it would be useful to find out if any other home exchangers have encountered a similar situation or have suggestions for insurance (which will vary in different countries) that would cover such an unexpected eventuality. Do leave a comment or contact us. Angela will soon be renewing her membership to start looking for a home swap for 2006. She has a very attractive offer in Auckland and hopefully her next exchange will go (as most do!) completely to plan. Undoubtedly one of the advantages of a home exchange vacation is that it cuts out the hotel/rental bill, one of the major vacation expenses for most people. However, from feedback we receive from the majority of Home Base Holidays members, the cost savings are not the main benefit of home swapping. Staying in another member's house or apartment with all the home comforts, getting to know a neighbourhood and meeting local people rather than, as often happens in a traditional vacation, mainly meeting other tourists, are the positive points of home exchange most often mentioned. The most successful home swaps are between members who know and like each other through regular correspondence during the course of arranging an exchange. There is much less chance of problems or misunderstandings arising during an exchange when people feel comfortable in the knowledge they have similar attitudes to the whole experience of home exchanging and to what will be included in the exchange on both sides. '.... approached me with an exchange offer and I said that I was interested but I never agreed to an exchange. I asked for photos of his property and information on the local area only so that I could have more information with which to make a decision. Although not the reason for my refusal to exchange, I was not happy with some of the aspects of this exchange offer. I felt he was very cheeky to expect us to leave our car for him to use because he "was on a budget" despite the fact that he had no car to exchange. We were already swapping a three bedroomed detached property in a capital city for a small flat in a town but it appeared that this wasn't enough - he wanted a free car as well! 'I actually start planning an exchange a year out, not always easy to plan that far ahead but it seems to work. I also contact people who may not necessarily mention New Zealand as a favoured place and in fact our Utah house exchangees were actually looking for Scandinavia! A: It is possible (with careful advance preparation) to arrange more than one consecutive exchange. Or, an easier way might be to arrange an exchange in one European country as your base for both visiting the area and for making short trips to other countries. With some very cheap flights now available between European cities plus Eurostar for London to Paris, Lille, Brussels trips, this is certainly feasible. A: It is of course up to individual Home Base Holidays members to decide who they will consider swapping homes with and, if it is important to them to swap with members with what may appear to be a comparable home to their own, that's fine. However, comparing property values is not the best way to judge a home. As an example: a modest Edwardian semi in a London suburb is very likely to be worth in market terms more than many large, luxurious rural homes with acres of land and swimming pools! It really all depends what you are looking for in an exchange - a particular type of house or, to visit an area of interest while staying in a conveniently situated home large enough to accommodate your family. Farmhouse with garaging, plus a 5 berth static caravan, small flock of sheep with lambs, duck pond and, of course, ducks that need feeding. 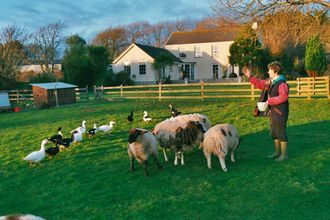 Rural but one mile from the sea and super local neighbours. Pub that is 500 metres away, with shop and post office. Read full exchange offer (the members are 'open to offers'), HE16796.